This issue, I have decided to review a novel, mainly because there a lack of furry novels. While this novel is not written with the fandom in mind, it does cover the furry criteria (i.e. the title character is a monkey with human qualities). Also, it is a novel with some importance to me locally. I come from the Teesside region of England, and one of the towns in it is the port town of Hartlepool. The most famous myth attached to the town is that during the Napoleonic Wars there was a shipwreck, the sole survivor of which was a monkey. However, the residents of Hartlepool did not know what the monkey was and so they hanged it, thinking it might be a French spy. Since then, the people of the town have been nicknamed “Monkey hangers”. The legend is one that has been adopted into the local ethos. The mascot of the town’s football club, Hartlepool United, is H’Angus the Monkey. One of the men who played him, Stuart Drummond ran for election as the town’s first directly elected mayor. He promised that if elected, he would give free bananas to all school children – and he won! Not only did he win, but he was re-elected in the next election with an increased majority, despite the fact he failed to deliver on his promise. 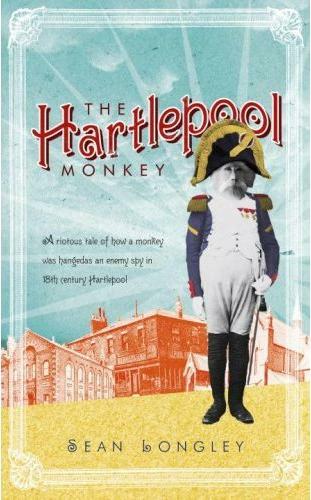 Anyway, to return to the point of my review, The Hartlepool Monkey is a novel based on the legend, telling the story of the monkey from its discovery to its eventual execution. The novel is split into three sections, each being told from the perspective of someone who meets the monkey. The first part is from a French doctor, Simon Legris, who discovers the monkey on a trip to the Slave Coast of Africa. Legris adopts the monkey, whom he calls Jacques LeSinge, and over time the monkey understand and eventually speaks French. Jacques leaves Legris after he is accused of behaving improperly with the wife of Legris’ boss, and joins the French Revolution. The story is then told from the view of Claudette, a prostitute who escapes to England with the help of a man later revealed to be the Scarlet Pimpernel. Claudette later falls foul of a drunken Lord Nelson but is saved by Jacques of all people (or should it be monkeys?). Jacques later finds himself shipwrecked in Hartlepool where he is put on trial for espionage. The story is then told by Warrens, a solicitor who tries to prevent Jacques from being hanged by trying to convince a court that Jacques is a monkey, and therefore cannot be tried. This leads to one question: what makes a human? This novel, the debut work from Sean Longley, will hopefully lead to a successful literary career. I do praise him for not mocking the people of Hartlepool themselves. However, I do have one minor quibble. The caption on the front of the books describes the book as, “The riotous tale of how a monkey was hanged as an enemy spy in eighteenth-century Hartlepool.” However, the monkey hanging legend almost always states that the monkey was hanged during the Napoleonic Wars, which took place almost entirely in the 19th century. Still, it is an enjoyable book which is an good read. The Hartlepool Monkey is published by Doubleday. A paperback version of the book is to be published in April 2009. It is listed on the Ursa Major Awards 2008 Recommended Anthropomorphics List. I think my relatives were involved in the hanging. Why, where they from Hartlepool?